Valence is a hand wound mechanical watch from Titan. The skeletal-dial watch with exposed watch mechanism visible through scratch-resistant sapphire crystal makes the watch come alive. 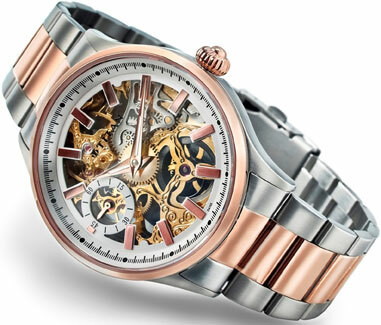 Designed in dual finish of steel and rose gold, with bold indices and large crown, the watch is a combination of classic mechanical watch encompassed in bold design. The see through threaded back cover and the offset seconds hand at the 9-Hour position further enhance the appeal of the watch. Price Rs 17,995. Available across the country in all World of Titan outlets, leading multi brand outlets and other stores like Shoppers Stop, Central and Lifestyle. You are currently browsing the watchalive weblog archives for March 2011.